Yamazaki Mazak Museum of Art, Nagoya, Japan, inv. FO-W0101. 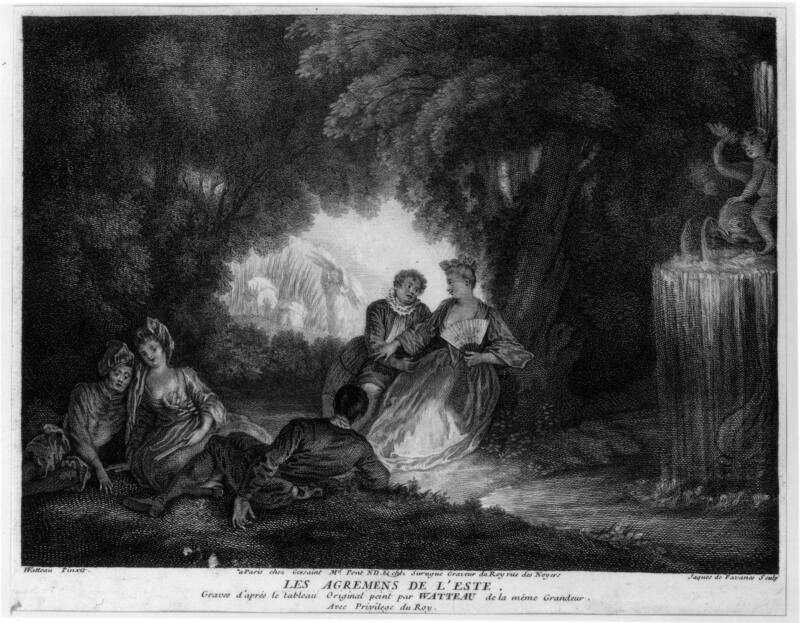 Jacques de Favannes after Watteau, Les Agrémens de l’esté, engraving, c. 1729-31. Les Agrémens de l’esté was engraved in reverse by Jacques de Favannes between 1729 and June 1731. An announcement in the June 1731 issue of the Mercure de France (p. 1564) lists it among seventeen Watteau compositions engraved within the last two years. The owner of the painting was not indicated when it was engraved by Favannes c. 1729-31. Paris, collection of Daniel Saint (1778-1847, miniaturist). His sale, Paris, May 4-7, 1846, lot 72: “DU MÊME [Antoine Watteau] . . . La moisson. Au premier plan cinq personnages se reposent assis près d’une cascade et sous l’ombrage de beaux arbres; dans le fond des paysans font la moisson. Tableau gravé.” Sold for 181 livres according to the annotated copy of the catalogue in the Rijksbureau voor Kunsthistorische Documentatie. England, Gluck (?) collection. This provenance is intimated in the Detroit 1926 and Royal Academy 1984 exhibition catalogues cited below. New York, Gimpel and Wildenstein. New York, collection of John Woodruff Simpson (1850-1920) and Katherine Seney Simpson (c. 1869-1943). Bought in 1909 from Gimpel and Wildenstein for $8,000. The sale is referred to in Gimpel’s Journal. Sold in 1943 to Wildenstein and Co. by Mrs. Simpson. New York, Wildenstein and Co.; sold through Wildenstein, Tokyo, in 1990. Nagoya, collection of Teruyuki Yamazaki (d. 2011); transferred to the Yamazaki Mazak Museum of Art. New York, Altman Gallery, Loan Exhibition of Fifty-nine Masterpieces (1915), cat. 57 (as by Watteau, Les agréments de l'été, lent by Mrs. John W. Simpson). Detroit, Institute of Arts, French Paintings of the Eighteenth Century (1926), cat. 55 (as by Watteau, The Pleasures of Summer, lent by Mrs. John W. Simpson). Hartford, Wadsworth Atheneum, Landscape Painting (1931), cat. 82 (as by Watteau, Les Agrements De L’Ete, lent by Wildenstein and Co.). New York, Union League Club, Eighteenth Century French Painting (1931), cat. 2 (as by Watteau, Les Agréments de l’été, lender not identified). Los Angeles, Museum, A Collection of European Paintings (1933), cat. 22 (as by Watteau, Pleasures of Summer, lent by Wildenstein & Company). Kansas City, Nelson Gallery, "French 17th and 18th Century" (1939) (as by Watteau, The Pleasures of Summer, lent by Wildenstein & Co.). New York, Wildenstein, French XVIIIth Century Paintings (1948), cat. 54 (as by Watteau, Pleasures of Summer). Montreal, Museum, Eighteenth Century Art (1950), cat. 43. London, Royal Academy, France in the Eighteenth Century (1968), cat. 728 (as by Watteau, Les agréments de l’Este, lent by a Lausanne private collector [sic for Wildenstein]). Hédouin, “Watteau” (1845), cat. 52. Hédouin, Mosaïque (1856), cat. 53. Goncourt, Catalogue raisonné (1875), cat. 99. Mollett, Watteau (1883), no. 93. Josz, Watteau (1903), 136 n. 1. Dacier, Vuaflart, and Hérold, Jean de Jullienne et les graveurs (1921-29), cat. 132. Réau, “Watteau” (1928), cat. 126. Adhémar, Watteau (1950), cat. 121. Macchia and Montagni, L’opera completa di Watteau (1968), cat. 110. Roland Michel, Watteau (1981), cat. 136. Washington, Paris, Berlin, Watteau 1684-1721 (1984), under cat. D17. Rosenberg and Prat, Watteau, catalogue raisonné des dessins (1996), 1: under cat. 161. Nagoya, Yamazaki Mazak Museum, Selected Works (2010), 6-7. Watteau, Two Studies of a Seated Woman, sanguine, 17.8 x 19.7 cm. Kansas City, Nelson-Atkins Museum of Art. 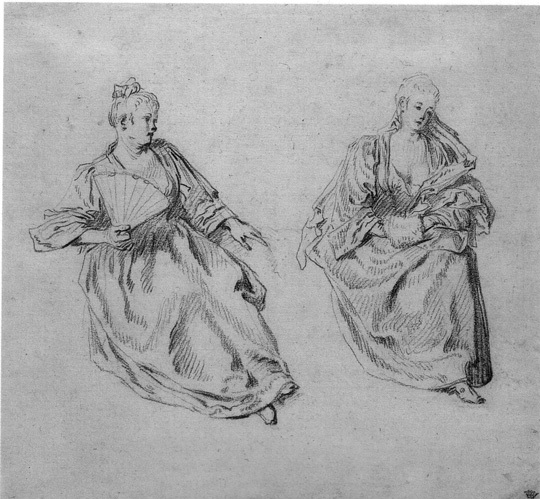 Only one Watteau drawing is directly associated with Les Agrémens de l’esté, a sheet of two studies of a seated woman (Rosenberg and Prat 161). The left one, which depicts the woman holding a fan in her right hand, was used for the painting. There she was given a bonnet and her left arm, stretched out to rest on a support, was cleverly turned into a gesture of self-defense. 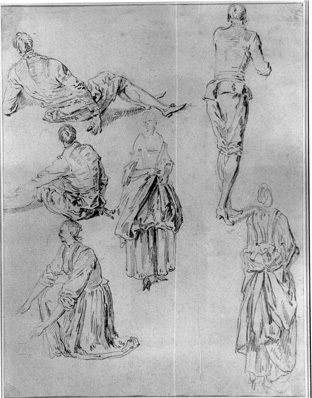 Anonymous draftsman, Studies after Watteau Drawings, black chalk, 19 x 30.5 cm. Formerly London, with Adolphe Stein. Anonymous draftsman, Studies after Watteau Drawings, red chalk, 21.7 x 16.6 cm. Cambridge, Massachusetts, Fogg Art Museum. The drawing for the figure of the man in the foreground, seen from behind, his right arm hanging limply behind his back is not extant, but it can be inferred from three other appearances. First, a drawing once on the London market, with Adolphe Stein, attributed unconvincingly to Norblin de la Goudaine, copies several early Watteau inventions. 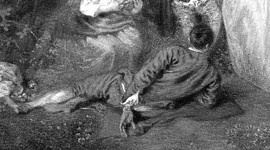 At the lower left corner is the same recumbent man seen in Les Agrémens de l’esté. 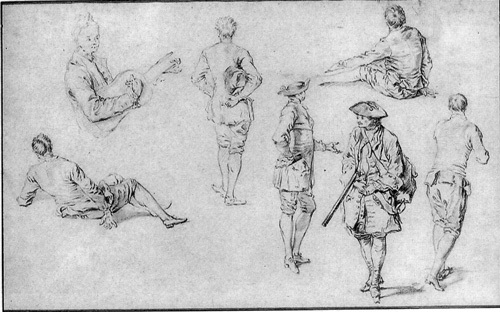 Secondly, a sheet in the Fogg Art Museum similarly copies various early Watteau drawings, and the same recumbent man appears in the upper left corner. Antoine Watteau, Le Plaisir pastoral (detail). Chantilly, Musée Condé. Third, Watteau used this lost figure study for a man in the foreground of Le Plaisir pastoral, the painting now at Chantilly. This type of complicated posture with limbs crossing in a mannerist way recalls early Watteau studies such as one of the counterproofs in the Stockholm Nationalmuseum that Count Tessin bought in 1715 (Rosenberg and Prat 122). This terminus ante quem offers a useful date in establishing this uncharted portion of Watteau’s chronology. A Watteau fête galante with a dissimilar composition was engraved under the title Les Agréments de l’été and this has naturally led to confusion. De Goncourt and Réau, for example, confounded the provenances of the two paintings. Although Adhémar dated the painting to between spring and fall of 1716, she assigned fifty of Watteau’s paintings to this nine-month period, an impossible number for such a short time. Adhémar’s 1716 group includes the two pendants at Troyes, L’Enchanteur and L’Aventurière, paintings that have much in common with Les Agréments de l’esté but that most scholars rightly date considerably earlier. Grasselli dated the Kansas City drawing to c. 1712, but refused to date the painting because of its poor condition. Rosenberg and Prat agreed that the drawing should be dated closer to 1712 than to 1716, but did not comment on the date of the painting. Roland Michel preferred 1714. The Yamazaki Mazak Museum dates the painting to 1715. Whether one chooses 1712, 1713, 1714, or 1715 (the choice is somewhat arbitrary), the painting is manifestly earlier than 1716. Given the heavily overpainted surface, there is little point in trying to be more precise until the original surface can be seen. One could accept the subject of Les Agrémens de l’esté as a scène galante or a straightforward contemporary genre scene. Elegantly dressed men and women relax during the heat of a summer day, finding relief under the shade of trees and near a cooling fountain, while farmers harvest wheat in the hot field beyond. Yet the origin of this representation extends back to a Renaissance tradition of representing the Four Seasons. There the times of the year were depicted both by aristocracy at leisure and by peasants at work, with the gentry often in the foreground and the peasants in a background vignette. Watteau was well acquainted with this iconographical tradition and used its motifs in different ways, especially in the early part of his career. 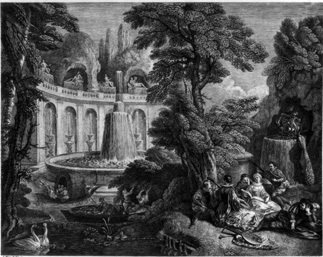 Jean Moyreau after Watteau, L’Été from the Saisons Jullienne, engraving, 1732. 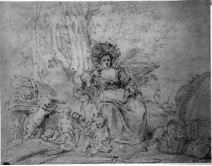 Watteau, Allegory of Summer, red chalk, 16 x 21.1 cm. Paris, Musée du Louvre, Département des arts graphiques. 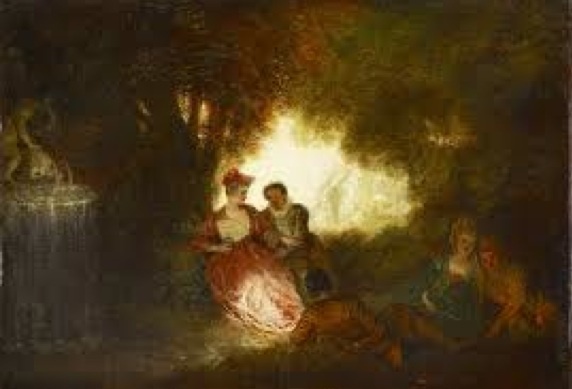 In Watteau’s L’Été from the Saisons Jullienne, courtly figures loll on the grass in the foreground and make music, not far from a cool grotto and fountain, while farther back less richly dressed people pick ripe fruit from trees. That composition, then, follows the Renaissance tradition. In a Watteau drawing in the Louvre (Rosenberg and Prat R522), the preparatory study for another allegory of Summer, a contemporarily dressed woman representing Ceres, the goddess of grain, relaxes in the foreground while putti harvest wheat. Even though this reverts to the more "classical" form of allegory, its leisurely mood accords with Watteau's other depictions of the season. In short, although the social elements in Les Agrémens de l’esté might seem to be just pleasant accessories, they have a well-defined lineage and function.